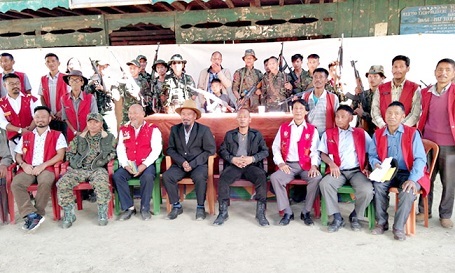 The Nagaland Gaon Burhas Federation (NGBF) has termed the Nagaland Cabinet’s decision to appeal for a review and re-examination of the Citizenship Bill as “unfortunate” and said it lacks the will and conviction to save the State from illegal immigrants. Sharing their opinion and understanding of the Bill, the village heads’ federation, in a release issued by its media cell, on Tuesday questioned, when other northeastern States, run by BJP allies and some BJP MLAs are calling for total scrapping of the Bill, what is hindering the Nagaland government to do the same. “This Bill should be opposed tooth and nail so that the coming generations will not curse us for the things we could have done when we had the opportunity,” the NGBF stated. The gaon burhas (village heads) claimed that the issue of illegal immigrants is of grave concern for the people in Nagaland. They said the contention of the State government that “no Act of Parliament shall apply to the state of Nagaland unless the Legislative Assembly of Nagaland by a resolution so decides since we have Article 371 (A) to protect us” is a “feeble argument” and “dangerous one”. “How assuredly can the government state that Article 371 (A) will absolutely protect the Nagas in the event of CAB 2016 becoming an Act?” the Federation asked. It said there is no mention of citizenship in the Article 371(A) and the hope of taking it as ammunition to oppose the Bill when it becomes an act “will not pass the legal scrutiny in time”. The Federation also stated that citing the Bengal Eastern Frontier Regulation Act 1873 as “one of the pillars to safeguard the Naga citizenship through the exercise of the ILP” is a misrepresentation of the Act. There is no relation between the Citizenship Bill 2016 and the Inner Line Permit, it added. The Citizenship (Amendment) Bill, 2016, which has already been passed in the Lok Sabha, is yet to get Rajya Sabha nod. “There is a marked difference between the two, which is self-explanatory and have no correlation whatsoever,” the gaon burhas said. They pointed out that the ILP or the Restricted Area Permit is for temporary movement within the State whereas the Citizenship (Amendment) Bill will grant legal citizenship which will have a disastrous implication. “If Nagaland is the only State where no illegal immigrants could enter as a result of the restrictions imposed by ILP, it could have been a different story from any other States in the country,” the Federation said. “However, it is not the case and despite the BEFRA 1873, our State has become a safe haven for illegal immigrants,” it further said. They, however, welcomed the State Cabinet’s decision to call a consultative meet of all sections, including tribal hohos, civil society groups, NGOs, political parties, prominent citizens and all stakeholders, to ascertain their views, opinions and suggestions on the issue.